Urbandale Homecoming Week: Sept 17th Through Sept 22nd Go J-Hawks! 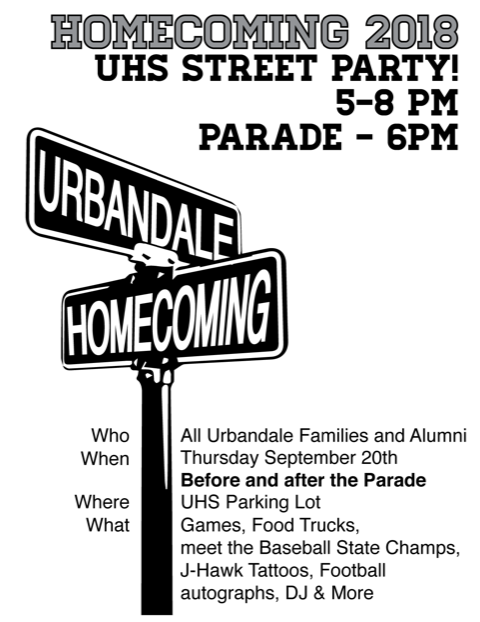 Come support your J-Hawks and celebrate our Urbandale community spirit during Urbandale High School Homecoming 2018. Homecoming activities will take place the week of September 17, 2018. 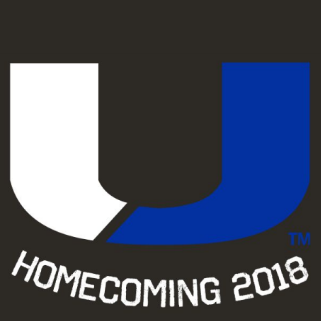 5:00 p.m.– 8:00 p.m. UHS Street Party (We’re hosting a Street Party in the UHS Parking Lot before and after the Homecoming Parade. This is a free event with lots of fun activities planned including games, J-Hawk tattoos, football team autographs, DJ, food trucks (food is for purchase), and some fun new activities we’re adding this year! Stop by the Urbandale Alumni Association booth as well with your stamped “Find the J-Hawk” cards (see below) for a prize! All Urbandale students, families, staff, alumni, and community supporters are welcome to attend. Go J-Hawks! “Find the J-Hawk”- Sponsored by the UHS Alumni Association. Each business will have a J-Hawk Mascot cut-out posted in their business. When you “Find the J-Hawk,” have the business stamp your card and proceed to the next business. You can get stamps from just a few businesses and turn in your card for a prize, but to win a special prize from one of the businesses listed below, you need to visit all 15 businesses. Turn in your card at the Alumni table/booth at the Street Party on Thursday evening, Sept. 20th after the parade. Winners will be drawn and then called to be notified that you have won. (Note: The businesses listed below have cards to play the game. 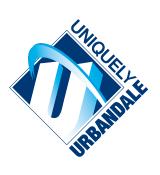 If a business runs out of cards, the Urbandale Chamber Office has additional cards.) Participating businesses: Vision Park Family Eye Care, The Chilly Cow, BMW of DSM, The Range Grill & Golf, Urbandale HyVee, Strauss Security Solutions, A-Tech Inc. Easy Living Store, Mudbum Supply Shack , EKGolf , R. Jones Collision, Urban Pet Hospital, Plaza Florist, Taco Hangover, DSM Buccaneers, and The Urban Grill. We wish everyone a safe, fun, and memorable Homecoming 2018! Sedmica Homecoming dešavanja u Urbandaleu: od 17. do 22. septembra Naprijed J-Hawks! Dođite da podržite naše J-Hawks i da u prazničkom duhu naše zajednice proslavite sedmicu manifestacije Homecoming 2018. Sve aktivnosti odvijaće se u sedmici koja počinje 17. septembra 2018. Svima želimo bezbjedan, zabavan i nezaboravan Homecoming 2018!